The KIN Consortium features "The London Stock Exchange"
"Chairman Natto's Views on the LONDON STOCK EXCHANGE"
In an effort to follow through with recent articles that discussed the efforts of SAGIA and His Excellency Amr Al Dabbagh, we at The KIN Consortium would like to show how Saudi Arabian Bonds are listed on the London Stock Exchange (LSE). The fact of the matter is that a range of Saudi Companies have raised and continue to raise Billions of Dollars from the LSE. 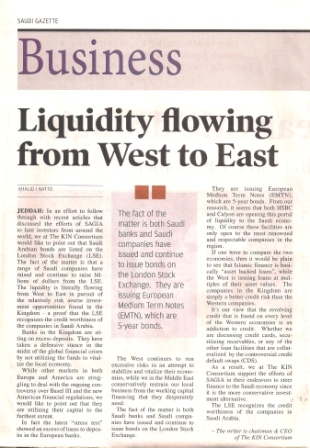 The liquidity is literally flowing from West to East in pursuit of the relatively risk averse investment opportunities found in the Kingdom of Saudi Arabia. Which is proof that the LSE recognizes the credit worthiness of the companies in the Kingdom of Saudi Arabia. The fact of the matter is the banks in the Kingdom of Saudi Arabia are sitting on an excess in deposits. They have taken a defensive stance in the midst of the Global Financial Crises by not utilizing the funds to vitalize the local economy. While other markets in both Europe and America, are struggling to deal with the ongoing controversy over Basel III and the new American Financial Regulations. We would like to point out that they are utilizing their capital to the furthest extent. In fact the latest "Stress Test" showed an excess of loans to deposits on the European Banks. The West continues to run excessive risks in an attempt to stabilize and vitalize their economies, while we in the Middle East conservatively starve our local business from the working capital financing that they desperately need. Some blame the central bank SAMA for the Non Performing Loan (NPL) reserve requirements, while others blame fear and shock at the reverberating effects of the Global Financial Crises. The fact of the matter is both Saudi banks and Saudi Companies have issued and continue to issue bonds on the London Stock Exchange. They are issuing European Medium Term Notes (EMTN ), which are 5 year bonds. From our research it seems that both HSBC and Calyon are opening this portal of liquidity to the KSA Economy. Of course these facilities are only open to the most renowned and respectable companies in the region. If one were to compare the two economies, then it would be plain to see that Islamic Finance is basically "Asset Backed Loans", while the west is issuing loans at multiples of their asset values. The companies in the Kingdom of Saudi Arabia are simply a better credit risk than the western companies. Its our view that the revolving credit that is found on every level of the western economies is an addiction to credit. Whether we are discussing credit cards, securitizing receivables, or any of the other loan facilities that are collateralized by the controversial Credit Default Swaps (CDS). As a result we at The KIN Consortium support the efforts of SAGIA in their endeavors to steer finance to the economy of the KSA since it is the more conservative investment alternative. The facts is the LSE recognizes the credit worthiness of the companies Kingdom of Saudi Arabia. Take a look at GE Capital raising ISLAMIC FINANCING at the London Stock Exchange. The Saudi French Bank also known as Banque Al Saudi Al Fransi is using Conventional Bonds that trade on the LSE as Euro Medium Term Notes.
" How to issue debt Islamic Finance: (see the listing process)." There are several steps towards issuing debt, which all issuers have to take. Admission to listing and admission to trading are parallel processes, in which the Exchange and the UK Listing Authority (UKLA) work together with issuers and their advisers (see the listing process)." This is a new form summarising document approval items for various transaction types, and includes direct links to individual forms.